- Season your chicken with salt and pepper on both sides and place aside. - Chop up the shallot into thin slices. 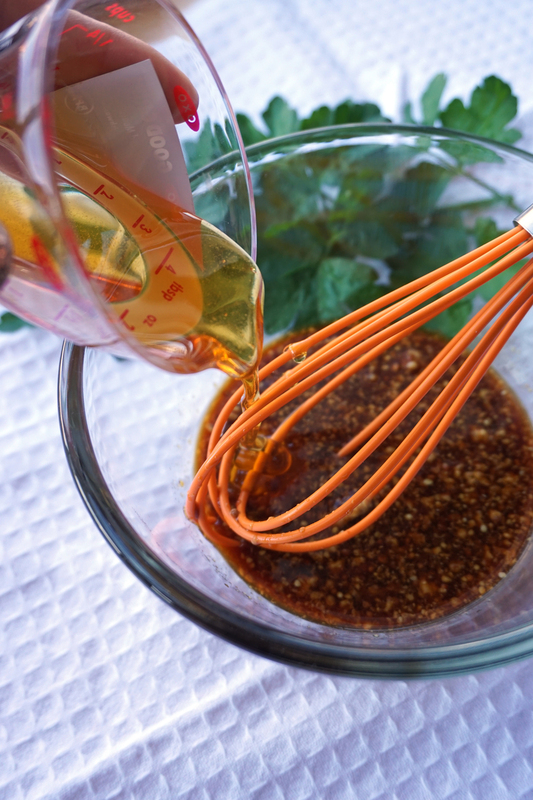 - Whisk together the whole-grain mustard, soy sauce, honey, and beer. Yum. - In a non-stick skillet over medium-high heat, heat 2 tsp of evoo. - Add the chicken to the pan, skin (or formerly skin-side) down so that you can achieve some nice browning. Cook until almost cooked thru, and remove the chicken from the pan. - One of my favorite tools in the kitchen is this $5 meat thermometer from IKEA. It’s super easy to use - you can set the temperature you need your protein to reach, and once the probe inside the meat reaches that temp, it beeps and lets you know it’s finished :) For thigh meat, cook till 165F. I removed the thighs from the pan at around 160F. - After you’ve removed the chicken from the pan, dump the shallots in. Let them soften a bit, and then pour in the beer mixture. - Allow the sauce to come to a slow simmer over medium heat, and add the chicken back into the pan. Spoon the sauce over the chicken to baste it as it finishes off cooking to temp.